French director Michel Hazanavicius has established a strong reputation as a master at mimicking the works of others; his two hilarious OSS 117 films skewer the silliness of spy movies by recreating their style and tone, whilst throwing a healthy dose of modern absurdity into the mix to create films that feel both like undiscovered cult gems and very fresh, irreverent modern works. 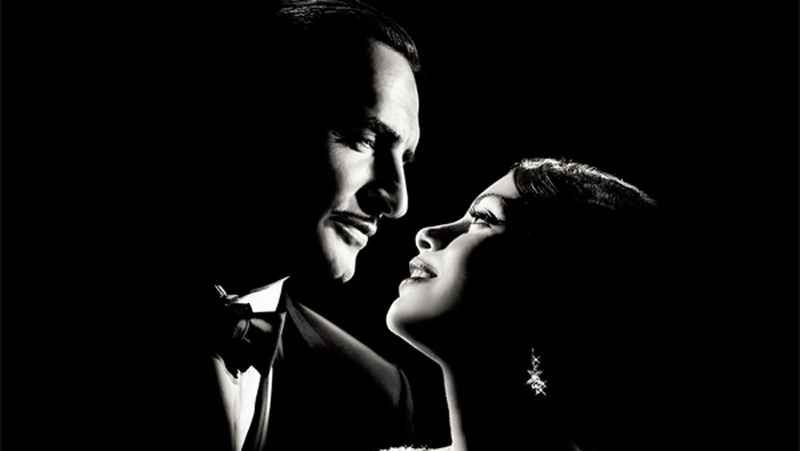 With his latest film, The Artist, Hazanavicius reaches for something grander by using the style and conventions of silent cinema to create a funny, touching and thoroughly charming romance that doubles-up as a tribute to the earliest days of Hollywood movie-making. The story begins in 1927, and George Valentin (Jean Dujardin) is one of the biggest stars on the planet. His films, all of which in some way revolve around intrigue, romance and his dog, whose primary function is to rescue his master from assorted scrapes, are wildly successful and beloved by audiences around the world. As he is preparing his next film, he meets Peppy Miller (Bérénice Bejo), an aspiring actress who gets a part in the film as a dancer who shares only one scene with Valentin. Despite this, there is an obvious connection between the two, but one that can't lead to anything because Valentin is married. However, their paths cross and recross over the next five years, as the birth of sound causes Valentin's star to wane and Miller's to rise, as she gradually works her way up from being an extra to a marquee name. The plot of The Artist may sound familiar - it's basically Singin' In The Rain (without the singin', or most of the rain) by way of A Star Is Born - but that doesn't diminish its power to move and astound, which comes largely from the film actually being a silent film, rather than a sound film about silent film. Freed of dialogue, the film relies upon the beautifully expressive faces of Dujardin and Bejo, as well as fine supporting turns by James Cromwell and John Goodman as a chaffeur and a movie executive, respectively, to convey the emotions of the story, and they do so brilliantly. The joy of the film lies in its purely visual nature, which hearkens back to the earliest days of cinema in a way that never feels affected or forced. There is a real heartfelt sincerity to the film that is absolutely beguiling, as indeed are the two stars, who have such a pure, natural chemistry and charisma that words would only taint it. Yet for all the old techniques that it employs, The Artist is a thoroughly modern, if not post-modern, movie. Hazanavicius understands that his audience is aware that it is not a lost silent film classic, but a film that uses old ideas and styles to comment on them, and he uses that conceit to great comic effect throughout the film. One particularly striking sequence is a dream that starts with Valentin setting down a glass on a table and hearing the "thunk" of the base hitting the top. Startled, he tries it again, and both he and the audience realise that he is living in a world of sound whilst he remains silent. It's a clever encapsulation of Valentin's story, as his pride and unwillingness to move with the times take him from being the most vital, important figure in Hollywood to a broken, forgotten relic in five short years, yet it's also a sly wink to the audience that acknowledges the artificiality of the film without undermining it. The film walks a fine line between tribute and parody, but it does so deftly, playfully riffing on the conventions of silent cinema without being mean-spirited or demeaning. At its heart, though, The Artist is a gorgeous, sweet and heartfelt love story, one between between George and Peppy, and between creator and medium. Even though they are well-trodden, the arcs of the two characters are so well-realised, and the performances (particularly Dujardin's) so affecting that their slow, steady and inexorable journey towards finally being together feels much fresher than it has any right to be. It's hard not to care about Valentin when, even as he is at his most bitter ebb, he still finds time to see every new film starring Peppy that comes out, and it's even harder not to care about Peppy when she so dearly loves Valentin that she secretly buys all of his possessions at auction so that they won't be destroyed or misused. Though the story of the film is largely tragic, and it is willing to go to some dark, melancholy places en route to its joyously uplifting finale, that central relationship is what gives it its heart and soul. Hazanavicius, meanwhile, uses the film to explore a deep and profound love for cinema that prevents the film from being a mere formalist experiment. The word that I keep coming back to when thinking of the film is "joy", and that sense of wonder and excitement at the possibilities of cinema as a romantic, escapist form can be found in every frame of The Artist. It taps directly into the elemental feeling of awe that makes film such a vivid and exciting medium, and the sense of fun that runs throughout the film, both in the moments when the film gently mocks the conventions of silent film and the moments when it embraces them fully, is intoxicating. Nowhere is this more true than in a scene in which Peppy discovers an old film reel that Valentin has held on to for years and years. As she looks through the frames and discovers what is on the reel, both the love between the characters and the love between Hazanavicius and the art of cinema itself collide, celebrating the way in which a series of images can capture something beautiful, freezing it in time so that it can be enjoyed forever, lighting the way in even our darkest moments. If imitation is the sincerest form of flattery, then The Artist is about as sincere and beautiful a tribute to the power of film as you are likely to see. It's just sheer joy from start to finish, and a remarkable, beautiful film about the remarkable beauty of cinema.